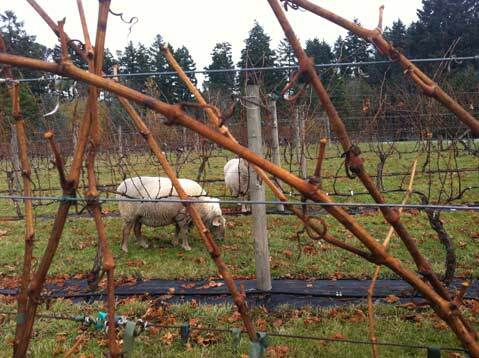 Sheep in a Vancouver Island vineyard. The terroir of a place has always drawn me in. The soil, the terrain, the microclimate — all aspects of terroir can really make you feel connected to a landscape. With that appreciation in mind, I recently traveled from my Santa Barbara home to southern Vancouver Island in British Columbia, where more than 40 vineyards and wineries have established themselves over the last two decades. Unlike the larger and more commercial establishments of Washington, Oregon, and the Okanagan Valley of British Columbia’s interior, the wineries on Vancouver Island tend to be family-run and are often the result of vineyard dreams that proprietors had while pursuing earlier professions. 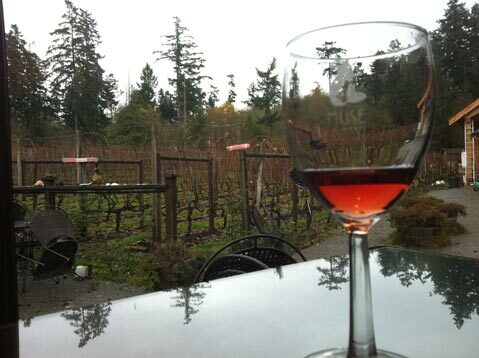 Rocky Creek Winery in the Cowichan Valley. Wine grapes proliferated on “The Island,” as it’s commonly known, due to a government study in the early 1980s that tried to identify varietals that might be grown successfully. The Pacific Ocean’s moderating influence keeps temperatures from getting too hot or too cold, and grapes are able to hang on the vines longer than in other parts of the Northwest. Interesting grape varietals such as Ortega and Blattner thrive with this extended growing season and result in wines of outstanding delicacy and balance. The unique terroir of the region comes through in the soft acidity and rich fruit character of these island wines, becoming the “somewhereness” of their taste. With this little background knowledge in hand, a bit of Santa Barbara County bias, and the hope to see the viticultural evolution in the country of my birth, my reconnaissance mission included stops in both Vancouver Island’s Saanich peninsula, which is adjacent to British Columbia’s capital city, Victoria, and the Cowichan Valley, about 30 miles north of Victoria. 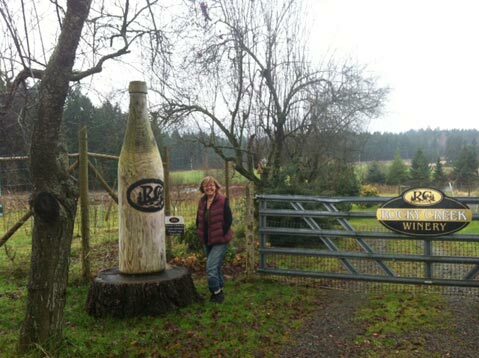 I explored Old West Saanich Road, a charming, winding road that took me through beautiful coniferous forests, past bucolic landscapes, and carried on to Dragonfly Hill Vineyard and Winery. Here I found the oldest vines on the peninsula, some of which were planted 20 years ago by winemaker Carol Wallace as cuttings from the Zanatta vineyard in the Cowichan Valley. Dragonfly’s unique terroir features elements of artesian water, limestone, and great drainage, and its previous life as an apple orchard and strawberry field are well reflected in the taste of the wines produced here. Wallace maintains a day job as a Canadian immigration officer, but will soon attend full-time to her growing winery. I detected hope that her daughters may one day develop a passion for winemaking and join her someday. Dragonfly’s Ortega was my first experience with the varietal from the island, and the winery’s popular white wine blends Ortega and Pinot Auxerrois grapes to exhibit bright floral aromas and hints of green apple in flavor. I had to take a bottle with me to enjoy it again with friends. A trip along West Saanich Road took me to the lovely Deep Cove area, where Muse Winery occupies a prime niche and the cool ocean air wafts through the vines of Pinot Gris, Ortega, and Marechal Foch. Peter and Jane Ellmann spent a long time looking for just the right winery location to raise their family, and immediately felt a connection to this place. The Ellmanns had a strong vision of what they wanted to create, coming from professional backgrounds in the hospitality industry in Canada and the United States. Their winery has a seasonal café adjacent to the vineyard and a small shop where visitors can purchase many of their award-winning wines and related wine products. Tasting room conversations with Jane revealed her connection to the land. Soils have a little more clay to them here and wines such as their Pinot Gris pick up more elements of the soil, giving it a slightly earthy flavor. Their Marechal Foch is a full-bodied red wine with a deep ruby color and soft tannins that also exhibits a light earthy quality to it. 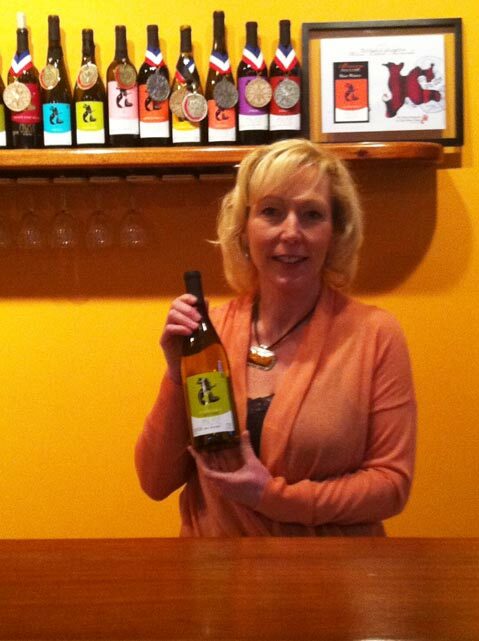 I was delighted to read the back labels of Muse’s wines while enjoying the convivial experience in their tasting room. Their Pinot Gris has been given the name, “Legally Blonde,” with a back label description of, “A festive giddy gal with lots of snappy one-liners. A crisp wit and a tart approach to life…she plays well with others.” I had to agree. A glass of Muse wine. From the Saanich Peninsula, I headed north up Highway One to the Cowichan Valley, about thirty minutes from Victoria. The drive took me past spectacular ocean and island vistas and into an area that boasts some of the highest average temperatures in Canada. With ideal growing conditions, the Cowichan Valley has the longest history of winemaking on the island and the most established vineyards. I have a strong preference for Pinot Noir so I was particularly interested to see how these wines reflected the terroir of the area. I found my way to Rocky Creek Winery and was greeted by owner Linda Holford, who escorted me to the cozy tasting room that overlooked rows of Blattner vines (a hybrid Cabernet-Marachel Foch grape). Rocky Creek produces a tasty Pinot Noir that has won several awards. The velvety soft wine had a little fruitiness to the taste but also hints of cloves and pepper. I even detected a lingering butterscotch taste that was unexpected. I was finally beginning to understand the term “liquid art” because winemaking requires not only a special skill set but also a unique and individual creative talent. Winemaker Mark Holford clearly has an artistic ability with his wines. He is perhaps an alchemist in the truest sense, having transitioned to winemaking from a career as a chemical engineer. My taste buds were happily primed for the next offering. Blackberries grow like weeds on the island, and Rocky Creek, like many of the island wineries, uses the abundant fruit to create a dessert style wine. This is not your grandfather’s backroom hooch, but rather a flavor explosion of terroir. You can taste the sun and the rain, the earth, the air. Perhaps it was the previous glass of Pinot clouding my tasting ability, but I really felt that I could taste the island in this wine. As had been suggested by island friends, the blackberry wine was delicious enough to consider pouring over gelato or ice cream. I was offered small bits of salted dark chocolate to pair with a second tasting and my taste buds sang. I left Rocky Creek with a bottle to take home to verify my experience with friends in Santa Barbara. Time allowed for only a brief sampling of this emerging wine region. Since Santa Barbara’s wine prowess is a source of pride, I was initially apprehensive that the colder, blustery climes of Vancouver Island could emulate that ideal. But maybe this is how it started in Santa Barbara as well, with small artisanal wineries paving the way for a region to develop its own sense of the grape, of the pungent smell of wet dirt coupled with the sweet smell of berries. The terroir defines the experience and in this case, the winemaker symbiotically expands upon it. Nancy Larman is currently completing a Master of Arts Degree in Intercultural and International Communication at Royal Roads University in Victoria, British Columbia where occasional campus residencies provide opportunities for exploring the viticultural playground nearby.